If you want to design a more comfortable office environment, it’s time to eliminate B/S: blinds and shades. Up, down, open, closed - there is a constant blinds battle in the office to combat the harsh heat and glare of the sun. Office workers do what they must to achieve comfort, leading to the common sight in many commercial buildings of “blinds down, lights on.” This behavior removes the positive impact of natural daylight and outdoor views, and also leads to increased energy use. Of course, companies want to provide employees with a comfortable office space that’s free of intense heat and glare, but unfortunately that’s not always the reality. According to a recent study commissioned by SageGlass, in partnership with its parent company, Saint-Gobain, one of the world’s largest building materials companies, there are many causes of discomfort in the workplace. The national survey of 400 office workers found that almost half (49%) are interrupted by sun glare at least periodically in the workplace. Of this group, 30 percent complained that the glare causes eye pain, gives them a headache (24%) and/or makes them feel annoyed (23%) or distracted (23%). To offset the negative effects of the sun, office workers adjust the blinds. The survey also found that of those with access to a window, 65 percent have blinds or curtains that block sunlight at least some of the day. However, along with blocking sunlight, blinds also block the restorative benefits of the outdoors. In fact, 32 percent of those with window access rarely or never see pleasant vistas. Uncomfortable employees are not good for productivity, but we also can’t forget about the restorative benefits of nature that could be realized if more employees had access to outdoor views. More than half of those surveyed felt looking at natural scenery while at work relaxed them (61%), provided a good way to take a break (60%) and reduced their stress level (53%). Access to daylight and outdoor views can have a significant impact on employee happiness, productivity, and ultimately, a company’s bottom line. Architects and building owners must look beyond traditional solar controls to achieve the ideal balance of daylight, views and comfort. And, dynamic glass is the perfect solution. 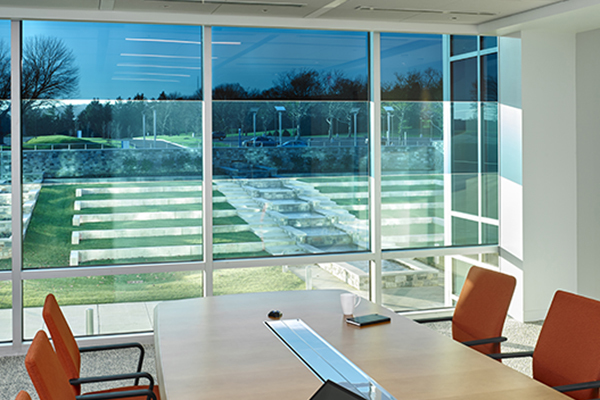 Dynamic glass controls sunlight to optimize daylight, outdoor views and comfort while preventing glare, fading and overheating without the need for blinds or shades. Dynamic glass eliminates the “blinds down, lights on” behavior and also dramatically reduces energy demand and the need for HVAC. It allows building occupants to maintain a connection to the outdoors no matter the time of day or position of the sun.